Other Names: The Masked Avenger, "Gentleman"
Chris was born in Rugby Warwickshire, England, which is located 15 miles from Stratford upon Avon, a town which claims fame from not only Chris Adams, but well known writer, William Shakespeare. Growing up in an active sports family, Chris acquired an admiration for all types of sports. He attended school in Stratford upon Avon where he excelled in such events as soccer, cycling, and rugby. It was during these early years, beginning at the age of 11, that Chris began Judo. Serious training for 14 years brought Chris numerous honors, such as: three years as National Champion for his age and weight, European Champion, and being a member of Great Britain's Olympic Judo Squad for four years. Chris' brother Neil is still actively involved in Judo. Neil was the silver medallist in the 1980 Olympics in Moscow and in the 1984 Olympics in Los Angeles. He has twice been the holder of the World Judo Middleweight Championship. Continuing his education, Chris studied architecture for four years. But the architecture field did not provide the excitement that Chris was looking for, so he decided to begin a part-time career in Professional Wrestling. With his athletic abilities and Judo training, Chris' popularity became fast growing throughout the British Isles. His rising fame and outstanding Professional Wrestling ability convinced Chris to travel to America to seek his fame and fortune. He arrived in Los Angeles in 1981 where he made his first American wrestling debut. Alas, being from a small town in England did not prepare Chris Adams for the fast paced culture he encountered when he arrived. But working throughout California and holding the American Tag Team Title with Tom Pritchard gave him the stamina it takes to be the champion he became. While residing in California, Chris was invited to wrestle in Mexico. While in Mexico, he wrestled in every major city and without any major experience, but because of his Judo and athletic ability, he won the WWF World Light Heavyweight Championship from Perro Aguayo, one of the most famous and notorious rule breakers on the Mexican circuit. After making his mark in Mexico, Chris continued on to the Far East. It was in Japan that Chris learned the secret of his famous "Super Kick." The maneuver that has rendered thousands of his opponents helpless, Chris' "Super Kick" was recognized as one of the most outstanding maneuvers in the wrestling world. Chris has had a tough battle to the top in Japan, as there were so many outstanding competitors. But wrestling names like Fuginami and Antonio Inoki, the famous fighter who fought Muhammed Ali in the worldwide telecast boxer vs. wrestler match, Chris was well on his way to becoming a household name in the art of Professional Wrestling. In 1982, Chris returned to the United States and made his home in the pacific Northwest. Together with the little experience and knowledge he had picked up in Mexico and Japan, he soon became a popular favorite throughout this area, with memorable battles against such stars as Rick Martel, Rip "The Crippler" Oliver and former NWA World Champion Gene Kiniski, just to name a few. 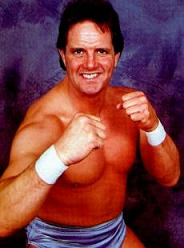 Progressing further into his professional career, Chris Adams joined World Class Wrestling in 1983. He quickly became a close friend and ally of the Von Erichs. During this time Chris' infamous battle with Gorgeous Jimmy Garvin developed. This feud was destined to become one of the most publicized battles in the wrestling world. When Garvin hooked up with his new valet, Precious, his former valet Sunshine, became Chris' valet and thus the feud erupted. The Adams and Garvin matches sold out arenas throughout the United States. But it was the mixed tag team events between these two ever-popular wrestlers and their valets that will always be remembered. After Garvin left World Class Wrestling, Chris decided he was fed up living in the Von Erich's shadow and decided to do something to remedy this. He hired Gary Hart as his manager and advisor. Mr. Hart, who is a shrewd and cunning master of ring mayhem, arranged a match between Kevin Von Erich and Chris at the Cotton Bowl in October of 1984. This is the battle remembered by all. The match that ended with a ride to the hospital for Kevin to receive several stitches to the head. It also ended a close friendship and was the beginning of probably the most famous duel known to all wrestling fans. These bouts between Chris Adams and the Von Erich family received the most publicity and notoriety of any Professional Wrestling matches in the world. It was at this time Chris was voted "The Most Hated Wrestler" by the official ratings system due to his association with Hart and Chris' newly developed attitude. Continuing on as "Bad to the Bone," Chris decided to team up with the flamboyant and extravagant Gino Hernandez. Known as "The Dynamic Duo," Chris and Gino became a very controversial and hated tag team all over the world. But the revered team went on the win the American Tag Team Championship, while continually battling the ever-present Von Erich family. In 1985 the Dynamic Duo decided to humiliate each of their opponents by clipping bits of hair from them with the famous "golden scissors," after the duo had defeated them. Some opponents that were clipped included Kevin Von Erich, Kerry Von Erich, Bryan Adias, Scott Casey, and "Ice Man" King Parsons. But the Dynamic Duo's luck was to run out at the Cotton Bowl in October of 1985. In front of 35,000 people, the Duo lost their belts and their hair to the Von Erichs. This was the first ever tag team hair match and the Duo were the ones left "Bald to the Bone." But it only took one month and the Duo were back on top again. Regaining their belts, the Chris and Gino team were once again on the prowl! Due to the various differences and points of view, Chris and Gino began to drift apart, which led to the most memorable match in Chris' career. At the end of January 1986, Chris and Gino wrestled against each other for the first time since their partnership began. The match was a fierce and intense battle with Chris making most of the moves until Gino picked up a bottle of acetone based hair remover sitting on the announcer's table and tossed the contents into Chris' face, causing him to be completely blind in both eyes. This allegedly was to be the end of Gentleman Chris Adams' Professional Wrestling career. Chris publicly announced an early retirement from this unpredictable profession and was seen leaving for the airport with his eves bandaged in what he thought was his last video to be seen on international syndicated TV. A long painful flight was next in line for Chris Adams as he was led to his seat on the DC-10 bound for London, England. "What is going to happen?" "Where will I go?" "What will I do?" "Will I every see again?" were just some of the questions going through Chris' confused mind on this eventful flight home. At 11:15 a.m. on February 2, 1986, Chris Adams arrived at London's Gatwick International Airport greeted by his worried parents and close family. Ther experience was traumatic. Over the next few weeks Gentleman Chris Adams was to re-evaluate his whole life. He began to realize that he had done wrong and had let his family, friends, and fans down. But it was too late, Chris allegedly would never see again. "It's funny how things in life re-evaluate themselves when circumstances change," Chris said. This was Chris' biggest lesson in life. The main issue in Chris' life at this time was to be able to see again. "If I could just see my family or the town where I was born. If I could just see anything. I promise I would be a different person from now on," Chris said. The days went slowly by while adjusted top feeling his way around his parents' home in Stratford upon Avon. Suddenly one cold, frosty morning, a surprising flash of light filled his head when his mother pulled the curtains in his bedroom as she brought him breakfast. "Mom, I can see the light, I can see the light!" from that day on, Chris slowly began to regain his eyesight in one eye. God had answered his prayers. With 95% vision in his right eye and about 20% in his left, Chris returned to Dallas to try and pick up with life where he had left off. At Texas Stadium on May 4, 1986, with consistent persuasion and pleading from friends and acquaintances, Chris entered the wrestling ring for the first time since his mishap, wearing a patch over his left eye. The response of the crowd to his return was overwhelming. With daily visits to his doctor, through workouts and incredible tenacity Chris slowly regained the strength and stamina that enabled him to continue his career. Day by day Chris' eyesight became stronger. Then, ironically, during a match with Rick Rude, Rude executed a move he calls the "Rood Awakening" to Chris at the Will Rogers Coliseum in Fort Worth. Chris' sight was totally restored from the otherwise damaging blow! After a seemingly never ending uphill struggle, Chris was allowed to enter the "Contract on a Pole" Battle Royale. The winner of this match would win the rights to a title bout against Ravishing Rick Rude, the current WCW Heavyweight World Champion. After a long fought battle, tearing tendons and ligaments in his hand on the jagged metal edges of the pole, Chris grabbed the contract as if it were the last hope of survival. Chris' determination had come through once again. With his eyesight restored, his hand completely recovered and a new outlook on life, Chris trained religiously every day for the remainder of time left before the title match. On July 4, 1986, at Reunion Arena in Dallas, this short, bloody match took place in front of 25,000 fans. The crowd was ecstatic, yet Chris was bleeding badly and the bout seemed hopeless for him to win. But with gut wrenching fortitude and courage, Chris turned the match around, pinned Rude to the canvas and won the Heavyweight Championship of the World! Chris successfully defended his title against the Japanese Fuginami, a foe from earlier years, Mad Dog "Buzz" Sawyer, one of the toughest men in wrestling, former champion Ravishing Rick Rude, and many others. Adams later left WCCW due to legal problems. On a flight with Kevin von Erich, Adams got into it with the pilot, head-butting him. Adams was thus sentenced to four months in jail for the transgression. After serving his time, Adams headed to UWF, where he formed a successful tag-team with Terry Taylor. The two held the UWF Tag-Team Titles for a few months in '87. When the UWF was bought up by the Mid-South, Adams stayed around for a time, before eventually heading back to World Class. Soon after, though, WCCW was bought out by the USWA, changing things yet again. Adams later hit his stride outside of the ring, at least partially, as he opened his own wrestling school, advertising it over the wrestling shows in Texas. This allowed Adams to pick from several strong candidates, including a young man named Steve Williams, who was later renamed Steve Austin and went on to considerable success with the WWF. Adams helped in Austin's growing fan base, having a feud with him where Austin began dating Adams' former wife, Jeanie Clark, causing Adams to feud with his student. Austin later went on, in real life, to marry Jeanie, showing that angles can sometimes become reality. Adams would later wrestle in several different locations, including the American Wrestling Federation and the Freestate Wrestling Federation, where he was the Executive Director from '96-'97. But Adams was interested in one more run at the big time, so he signed on with Eric Bischoff at World Championship Wrestling in the late '90s. Ultimately, however, Adams didn't have much of a run with WCW, although he stayed there, on and off, for a few years. Even being known as "The Gentleman" didn't get the fan support behind him, keeping him at the mid-card level without many shots at the gold. Adams also had other problems to worry about. In April '00, Adams' girlfriend, Linda Kaphengst passed away from an overdose of alcohol and gamma hydroxybutyrate (GHB), an illegal designer drug. Adams, who was found passed out next to her on the floor, was charged with manslaughter a few months later, and was facing a 20-year sentence in prison. Sadly, the trial never took place. On Sunday, October 7th, 2001, Adams' best friend, William Brent Parnell, who had been the best man at Adams' wedding to his new wife, Karen, shot Adams in the early morning after they had been drinking, claiming that it was in self-defense. Adams died from the chest wound, ending his life too soon, much like many of the wrestlers he worked with in World Class. It's sad to think that Adams will be more remembered for how his career, and life, ended, then how it was such a success, both as a wrestler and as a trainer. He was 46 years old. - British Heavy Middleweight Title Tournament (November/December '78) = Adams beat Ringo Rigby and Mick McManus before losing in the finals to Mark Rocco. - NJPW MSG League (May/June '81) = Adams competed in the league, which was won by Antonio Inoki. - WCCW Wrestling Star Wars (June 17, '83) = Adams, Jose Lothario, & Chavo Guerrero Sr defeated Bill Irwin, Fishman, & the Mongol. - WCCW Thanksgiving Star Wars (November 24, '83) = Adams won the American Heavyweight Title from Jimmy Garvin. - WCCW Christmas Star Wars (December 25, '83) = Adams lost the American Heavyweight Title to Jimmy Garvin. - WCCW January Star Wars (January 30, '84) = Adams regained the American Heavyweight Championship, beating Jimmy Garvin. - WCCW 1st Annual Von Erich Memorial Parade of Champions (May 6, '84) = Adams & Sunshine took down Jimmy Garvin & Precious. - Mid-South Superdome Extravaganza (June 16, '84) = Adams & Stella Mae French beat Jimmy Garvin & Precious. - WCCW Independence Day Star Wars (July 4, '84) = Adams & Stella Mae French won a "Loser Leaves Town Steel Cage" Match over Jimmy Garvin & Precious. - WCCW Labor Day Star Wars (September 3, '84) = Adams won the Television Title, taking down Jake Roberts. - WCCW 1st Annual Cotton Bowl Extravaganza (October 27, '84) = Adams was pinned by Kevin von Erich. Later on, the Dynamic Duo (Adams & Gino Hernandez) & Jake Roberts defeated Bobby Fulton, Kerry & Mike von Erich. - WCCW Thanksgiving Star Wars (November 22, '84) = Adams won a "No Disqualification" Match over Kevin von Erich. - WCCW Christmas Star Wars (December 25, '84) = Adams lost a "Lumberjack" Match to Kevin von Erich. - WCCW January Star Wars (January 28, '85) = The Dynamic Duo & Jake Roberts defeated the Fabulous Freebirds. Later on, the Dynamic Duo & Roberts fell to Kevin, Kerry, & Mike von Erich. - Mid-South Superdome Extravaganza (March 30, '85) = Adams, as the American Heavyweight Champ, lost, via DQ, to Kerry von Erich. - WCCW 2nd Annual Von Erich Memorial Parade of Champions (May 5, '85) = The Dynamic Duo beat Scott Casey & the Great Kabuki. Later on, the Dynamic Duo, Rip Oliver, Steve Williams, Kimala, & the One Man Gang lost a "2 Ring 5 Falls" Match to Kevin, Kerry, & Mike von Erich & the Freebirds. - Mid-South Television Title Tournament (May 5, '85) = Adams lost in the first round to Steve Casey. Jake Roberts won the tournament. - WCCW Independence Day Star Wars (July 4, '85) = Adams was beaten by the Great Kabuki. Later on, the Dynamic Duo took down Kevin & Kerry von Erich. - WCCW Labor Day Star Wars (September 2, '85) = Adams was pinned by Kevin von Erich. - WCCW 2nd Annual Cotton Bowl Extravaganza (October 6, '85) = The Dynamic Duo lost a "No Disqualification Hair vs. Hair" Match to Kevin & Kerry von Erich. - WCCW Thanksgiving Star Wars (November 28, '85) = The Dynamic Duo won the vacated American Tag-Team Titles, winning a "Steel Cage" Match over Kevin & Kerry von Erich. - WCCW Christmas Star Wars (December 25, '85) = The Dynamic Duo stayed the American Tag-Team Champs, but lost, via DQ, to Kevin & Kerry von Erich. - WCCW January Star Wars (January 26, '86) = Adams won, via DQ, over Gino Hernandez. - SCW Texas Cup Title Tournament (January '86) = Adams took down El Fantasma, Paul Diamond, Wahoo McDaniel, & Kareem Muhammad, before losing in the finals to Bruiser Brody. - WCCW 3rd Annual Von Erich Memorial Parade of Champions (May 4, '86) = Adams & Brickhouse Brown defeated John Tatum & the Grappler. - WCCW Independence Day Star Wars (July 4, '86) = Adams won the WCCW Heavyweight Title, beating Rick Rude. - WCCW Labor Day Star Wars (September 1, '86) = Adams & Lance von Erich took down Socko & the Dingo Warrior. Later on, Adams & von Erich fell to Buzz Sawyer & Matt Borne, who won the vacated WCCW Tag-Team Titles. Finally, Adams, as the WCCW Champion, won, via DQ, over Rick Rude. - Mid-South Superdome Extravaganza (April 11, '87) = Adams & Terry Taylor retained the UWF Tag-Team Titles, defeating Rick Steiner & Sting. - Mid-South Superdome Extravaganza (June 13, '87) = Adams was beaten by Black Bart. - UWF Western States Title Tournament (June 20, '87) = Adams lost in the first round to the eventual winner, Barry Windham. - NWA Great American Bash '87 (July 4) = Adams won, via DQ, over Black Bart. - NWA Great American Bash '87 (July 18) = Adams took down Black Bart. - Mid-South Superdome Extravaganza (August 1, '87) = Adams lost a "Taped Fist" Match to Rick Steiner. - WCCW Thanksgiving Star Wars (November 26, '87) = Adams & Matt Borne won, via DQ, over the Iron Sheik & the Thing. - WCCW Christmas Star Wars (December 25, '87) = Adams, Kevin von Erich, & Steve Simpson won the vacated WCCW 6-Man Tag Titles, winning a "Steel Cage" Match over Terry Gordy, Buddy Roberts, & Iceman Parsons. - WCCW 5th Annual Von Erich Memorial Parade of Champions (May 8, '88) = Adams lost to the WCCW Texas Champion, Terry Taylor. - TSWA Autumn Armageddon (September 15, '90) = Adams & Kevin von Erich fought to a Double Count Out with Al Perez & Austin Idol. - Pat O'Conner Memorial International Tag Team Tournament (December 16, '90) = Adams & Norman Smiley lost in the first round to Rey Mysterio Jr & Konnan. The Steiner Brothers won the tournament (held at WCW Starrcade '90). - AWF Heavyweight Title Tournament (November '94) = Adams beat the Warlord and Greg Valentine, then fell to Bob Orton Jr. Tito Santana won the tournament. - AWF Tag-Team Title Tournament (May '95) = Adams & Konnan 2000 took down the Samoan Swat Team in the first round, but later lost. Greg Valentine & Tommy Rich won the tournament. - WCW World War III '97 (November 23) = Adams competed in the "WWIII 60 Man Three Ring" Battle Royal, which was won by Scott Hall. - WCW World War III '98 (November 22) = Adams competed in the "WWIII 60 Man Three Ring" Battle Royal, which was won by Kevin Nash. - WCW United States Heavyweight Title Tournament (March/April '99) = Adams lost in the first round to Chris Jericho. Scott Steiner won the tournament.